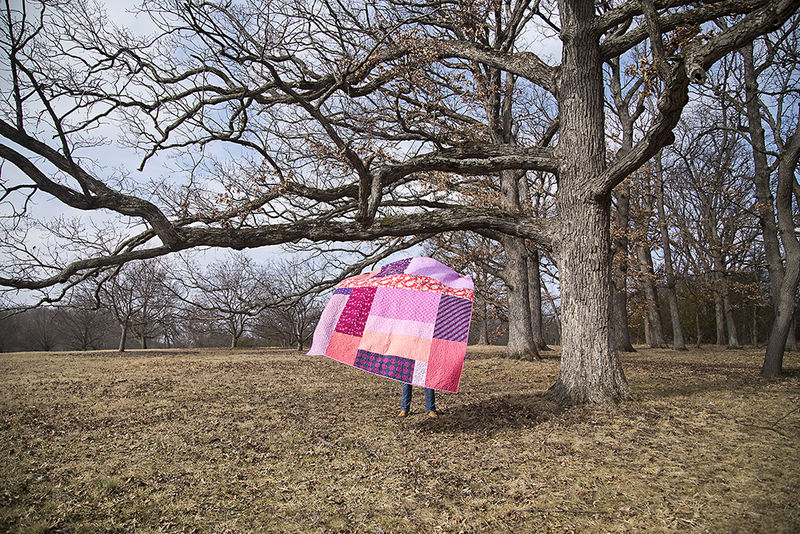 Finally, I have photos of my finished Picnic Point quilt! You have to dig pretty far back into my blog to find the beginnings of this one. Back when there were actually flowers in my yard! I pieced all the blocks when I was in New Glarus for a selfish sewing weekend. I love those. It's always a fun challenge to take half square triangles and play with color, layout, and negative space. (Notice I did not say it is fun to trim the actual HST units.) 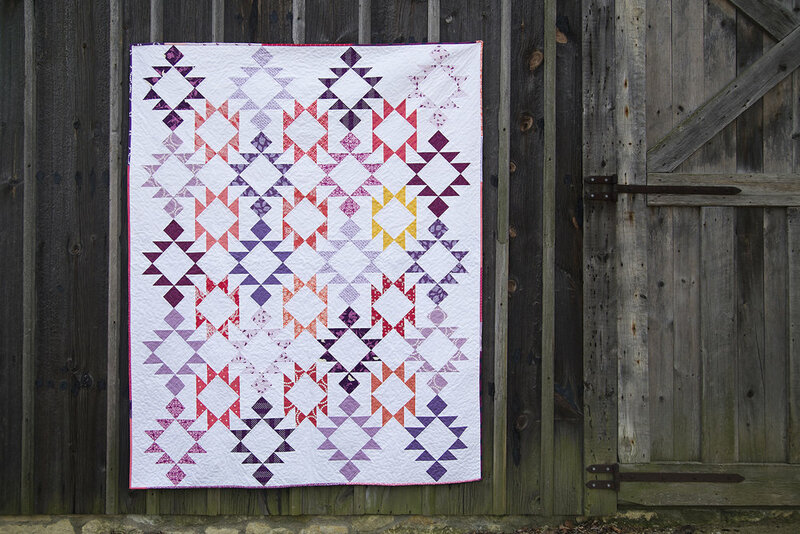 This quilt also uses blocks placed on point, which is another one of my favorite things to do when designing. I didn't want to buy fabric just for the back, so I pieced together several prints from my stash. It was a bit like Tetris, finding pieces large enough and making them fit. Of course when it came time to photograph the back, it was super windy here in Chicago! My poor husband. Our local Arboretum is really pretty though, isn't it? I ended up getting a less attractive, but more informational, photo on my back deck. The finished quilt measures about 67" x 84". It's a bit larger than I usually make but was definitely quilt-able on my home machine. I quilted it on my BERNINA 750QE using the Bernina Stitch Regulator and a meandering free motion design. It took about 2 mornings to complete. I really just can't sit happily quilting longer than that ~ sore shoulders! The binding is a scrappy assortment. Some of it actually comes from the extra backing I trimmed off the sides after quilting. Others from my stash. I think it's a fun addition! It feels good to check this UFO off my list - and to have the quilt ready for snuggling. I am putting the finishing touches up on the pattern and will update the blog when it is in the shop! This pattern is now available in the shop!